This entry was posted on July 21, 2011 by Sports Traveler. As the hottest days of summer creep through the midwest this week, the smell of football begins to tickle the nose. August is just around the corner and with it comes double and triple sessions for college football athletes around the country. A brand new campaign will be starting soon so let us look ahead to the 2011 college football season and examine a few BCS favorites, strong conferences, and a few Heisman hopefuls. In most of the preseason polls you will find the Oklahoma Sooners at the top of the list. Bob Stoops and his Sooners look poised and ready to make a run towards another BCS Championship game. Oklahoma has a very complete team with a great offense lead by star quarterback Landry Jones. Jones is a pre-season Heisman Trophy candidate and looks to build on his excellent 2010 season where he ranked second in the nation in both passing yards and touchdowns. This season is full of questions for many teams and Oklahoma just seems to have the fewest holes. 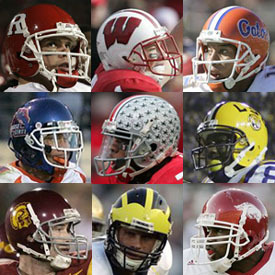 If they can live up to their talent level and make the BCS title game then it would be their fifth trip since 2000. The Big 12 currently has 5 teams in the top 25 according to ESPN.com. However, of the five teams that appear on the preseason poll, Oklahoma and their rival Oklahoma State are the only teams that are real BCS Championship contenders. Among several coaching changes this past off-season, there were also conference changes for some teams. The biggest move in the NCAA was Nebraska moving from the Big 12 to the Big 10, but it certainly wasn't the only news in the off-season for the Big 10. "THE" Ohio State University is still dealing with the aftermath of Terrelle Pryor and the departure of well accomplished coach Jim Tressel. These violations by the university are provoking the NCAA to crack down on violations and they are targeting the most prestigious programs. The Big 10 will be strong this year but it will be very interesting to see how the elite programs (Michigan and Ohio State) of this conference will rebound from recent troubles. No program has more NCAA wins than the University of Michigan and now they look to new head coach Brady Hoke to bring them back to the national championship stage. Be sure to watch Denard Robinson (QB, Michigan) make a run for the Heisman, and also look for Wisconsin to make a return trip to the Rose Bowl and possibly contend for a BCS championship. The SEC will once again be a dominating conference with several teams getting votes for the pre-season top 25. Most polls currently show Alabama as the highest ranking SEC team (#2) but there is a lot of talk about LSU (#4) and the potential of Les Miles and his Tigers. Nick Saban and Alabama will surely be prepared for another chance for an SEC championship, and they will look to their mutli-talented running back Trent Richardson to perform well for the team and his own Heisman intentions. A total of seven teams are currently ranked in the ESPN.com "Way too early" pre-season poll, but it is hard to tell if any of these teams will represent this conference in the BCS Championship game. Once again the SEC will most likely be the best conference in college football, but with so many good teams it is hard to make it through an entire season in the SEC without losing a game or even just having one loss. The BCS standings make it difficult for a team to make a run for the championship game with even one loss. One thing we can all count on is the SEC will feature several electric athletes and truly exciting football. The PAC 12 is home to the Heisman favorite Andrew Luck (QB, Stanford) and fellow Heisman hopeful Darron Thomas (RB, Oregon). The conference won't be the best in the country but it should have 2 or 3 really good teams this year (Arizona State, Oregon, and Stanford). The bottom of PAC 12 looks pretty harmless but the teams at the top can definitely threaten to make a trip to a BCS game and even the championship. Don't forget about the small guys either! Trending teams like TCU and Boise State will also look to make another run at an undefeated season that could possibly land them in the BCS Championship game. After last year, I think we all realized that a championship game could very well feature 2 programs that are smaller and less known than the USC's and Oregon's of the world. Both TCU and Boise State are listed in almost all pre-season polls and both have a good shot at returning to a BCS bowl game. Another thing to watch for is Boise State quarterback Kellen Moore. Moore was a big piece of the Broncos 12 win season last year and this season he will set his sights on being one the best QB's in the nation as he will hope to challenge for the Heisman. Soon the hard work of the off-season with the countless days on the practice field and hours spent in the gym will start to pay off for these young men. Some teams will begin their quest in hopes of just making a bowl game. Other teams will be looking to just make an improvement on last year and move forward. Then for some teams the war for the national championship will begin. Only a few teams stand a real chance of getting to New Orleans and playing in the Superdome for the right to be called a NCAA champion. The excitement of the college football season is building and Sports Traveler is ready to help you travel to any college football game during the 2011-12 season. See prestigious programs like Alabama, Auburn, Notre Dame, Texas, and many more! This could be the year for your favorite college team. Support your school on their journey to a BCS bowl game or any other bowl game. Sports Traveler has tickets and travel packages available to all bowl games including all BCS bowl games. Travel to a rival stadium and sing your fight song as loud as you can, or watch your favorite team fight for a glorious Homecoming victory. College football fever is spreading so check out Sportstraveler.net today!